AFP reports from a security source in Nairobi that Israeli special forces joined the Kenyan military in storming the Westgate shopping mall, Sunday, Sept. 22, to break the standoff with some dozen Al Qaeda-linked Somali Al Shabaab gunmen barricaded there with hostages for the second day. The death toll from the Saturday shooting-grenade attack has risen to 59 with 205 people injured. debkafile, the only world publication to reveal the Israeli involvement from the start of the Nairobi mall attack Saturday, now discloses that the Israeli commandos were airlifted to Kenya when the Westgate mall was first attacked. Nairobi invoked a secret security pact between the two governments under which Jerusalem guarantees military assistance should the Kenyan government be threatened by a foreign force. This was the first time Israeli special counter-terror forces have fought Al Qaeda terrorists face to face on foreign soil. The Israeli foreign ministery refused to confirm or deny any inovlvement in Kenya. After releasing Muslims, the raiders held onto an unknown number of hostages, some on the ground floor where Israeli shops are located; more in other parts of the seven-floor building. Unknown too is the number of injured and possibly dead victims, including foreigners, who are still trapped in the building. American, British, Canadian and French citizens were reported killed or injured in the initial attack Saturday. The Kenyan and Israeli authorities have blanketed with secrecy the scene inside the mall, from which a barrage of gunfire and explosions were heard during the morning. Local police and special forces are trying to force the Islamist gunmen to surrender and give up the hostages. Israeli security experts are known to be assisting in the operation. The US sent a commando unit to Nairobi from bases in Italy and the UK, an advance counter-terror forward team. The Cobra cabinet is holding continuous sessions in London as the situation unfolds. In Israel, no one in authority is willing to comment on the incident, despite Israel’s involvement. Three Israelis were reported rescued from the mall Saturday, but there is no word on any who may still be trapped there. Since its creation in 2006, the Somali Al-Shabaab has maintained strong operational ties with the Yemen-based AQAP command for its long and bloody insurgency against the Mogadishu government. Our counter-terror sources report that the Somali wing receives training, munitions and medical care at al Qaeda’s Yemeni camps. They interact frequently by means of speedboats plying regularly between the Yemen and Somalia. 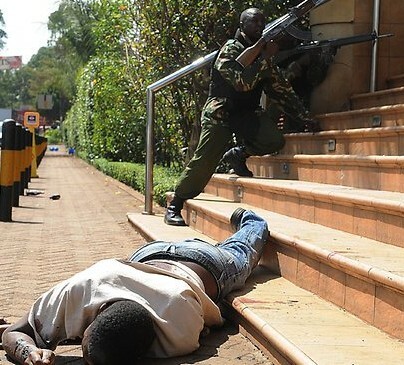 The scale of the Westgate mall attack, which was carried out by up to a score of well-trained fighting men armed with large quantities of ammunition, pointed to heavy AQAP involvement from the word go. In the past, Al Qaeda has notoriously singled out American and Israeli targets in East Africa – the 1998 attacks on the US embassies in Kenya and Tanzania, and the 2002 assault on Israeli tourists in Mombasa. However, the Nairobi attack was related to the present. Al Qaeda’s eyes and ears in Kenya didn’t miss the military and intelligence assistance Israel renders Kenya for its operations against Islamist terror in two areas: The Israeli army and security bodies send combat equipment and provide tactical advice to the Kenyan units fighting alongside Somali government forces against Al Shabaab; and Israel’s intelligence agencies and police are helping the Kenyan government build a strong shield or barrier against the Somali war’s spillover, to guard against Al Shabaab opening up a second front to the rear of the Kenyan forces fighting across the border. This protective barrier clearly sprang a large leak Saturday. See debkafile’s first report on the Westgate Mall attack Saturday, Sept. 21.